And just like that, a new year on the WSL Championship Tour begins this weekend. Once again we start the tour off in Australia on the shores of the Gold Coast. 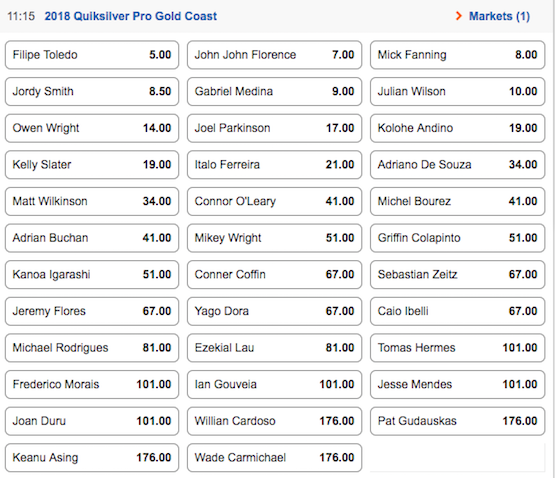 The Quiksilver Pro event window begins on the 11th of March and runs through to the 22nd. This is not just the start of a new season but it's also the first leg of the three events held in Australia. This year on the WSL Tour is set to be massive, with news coming out prior to the start of new season that Mick Fanning will be hanging the vest up at the illustrious Bells Beach event. With Fanning’s retirement near, questions flow in about veteran world champion Kelly Slater status, could this be his last year? With retirement flooding the headlines we all tend to forget that John John Florence will be attempting to win his third world title, which hasn't been done since Andy Irons achieved this in 2002-2004. Mark Richards, Kelly Slater and Andy Irons are the only surfers to win three or more world titles in the history of the world surf tour. Since the Quiksilver Pro on the Gold Coast began in 2002, the event has predominantly been owned by natural foot surfers. In fact the only goofy foot surfer to take the crown was Gabriel Medina in 2014. Australian surfers have dominated this event over the years, with Joel (Parko) Parkinson, Mick Fanning and Taj Burrow winning this event twice. Kelly Slater has flown the American flag, winning this event an amazing four times, the last back in 2013 when he took down Joel Parkinson in the final. Last year Owen Wright got off to the fast start after claiming the event over fellow countrymen Matt Wilkinson. Wright is a big powerful surfer and I truly think he will start strong in the Australian leg. It's a tough competition to pick a winner but if you look at the end of last year, we started to see Gabriel Medina crack into form very late into the season, as he took out two of the last final three events, only to come up short behind John John Florence for the world title. Julian Wilson had his best season, finishing the year ranked third. Wilson has so much talent and also has so many strengths, but over the years has struggled to find that consistency that's needed for that world title. The WSL has welcomed some new faces into the 2018 competition, Brazilian Jesse Mendes will make his first round debut when he meets two of the best in Kelly Slater and Mick Fanning. Mendes spent almost a decade on the qualifying series and now gets his chance to join his Brazilian team mates on tour. There is also a lot of noise Surrounding Rookie Australian Wade Carmichael. Carmichael had a up and down 2016, before moving forward in 2017 to claim fourth position in the qualifying series and earn a spot in the 2018 WSL. Should be another entertaining but emotional year ahead in the WSL, but the question is, can anyone upset the World Champ John John Florence?